Note: This trip will be collaboration with My Partnership and I also using Local Guide proffesional. name of a major Catholic Seminary which forms many Florinese priests, Lunch provided en route. spectacular and mysterious sight Indonesian. Trekking down to Moni with stop in Lia hot spring and Waterfall, Lunch in Ende. Afternoon; drive to Bajawa . En routestop at Penggajawa – the blue pebbles beach.,Overnight and dinner at Bintang Wisata Hotel. traditional villages furnished with stone monuments, ancestor worship shrines and ADAT houses.The hamlets are beautifully settled in the volcanic mountainous area. The most beautiful onces are BENA and WOGO. Then visit local market area in Bajawa town driving down to the leg of Inerie volcano as starting point trek to Bena and Todolela traditional villages are settled on the leg of volcano mountain. Lunch box will be provided en route, Dinner and overnight at Todolela Villagers houses. After having breakfast trekking down to Gurusina is a traditional village of Ngada tribe. After you left the settle area you enter in a very interesting strong agriculture influenced area. On the way you can find the local farmers are cultivating their field. Water buffaloes and other domestics animals like pigs and goats are on the way. Rice fields where you can see the different steps and phases of planting and cropping are good visible and quite impressive. Also vanilla, candle nut, cacao, white pepper, coffee and other various kinds of plantations.It is interesting to walk through an extremely huge green garden with a lot of new tropical crops and local agriculture methods. At the end of the trekking you could taking bathing on the meeting point between hot & cool spring. After lunch driving to Bajawa for dinner& over night. capital city of Manggarai Regency where major Manggarainese tribe dwelt. ,and at lake Ranamese to follow the trail in the cloud forest.Lunch in Ruteng. Afternoon;visit LIANG BUA the home of “HOMOFLORENSIES”Dinner and Overnight at St MARIA Mission Hotel. rice field ever exist on earth. Lunch will be served in Narang beach, before or after lunch getting fresh by swimming on the savu sea. Then continue to denge village for overnight stay in Denge quest house. After having breakfast in Denge village quest house, start trekking abt 3 ½ hours to waerebo – the oldest traditional villge of Manggarainesse. The rain forest a long the trek to Waerebo is one of the wealthiest areas in Indonesia in biological terms. The forest is simply like a huge garden of Eden. The walk through the forest with deferent vegetation is of greet interest, from the families of orchids, palms, ferns, etc. Natural voice of various type singing birds will entertain you a long the trip. The clear and fresh water river on the way up to the village is a good point to take rest. 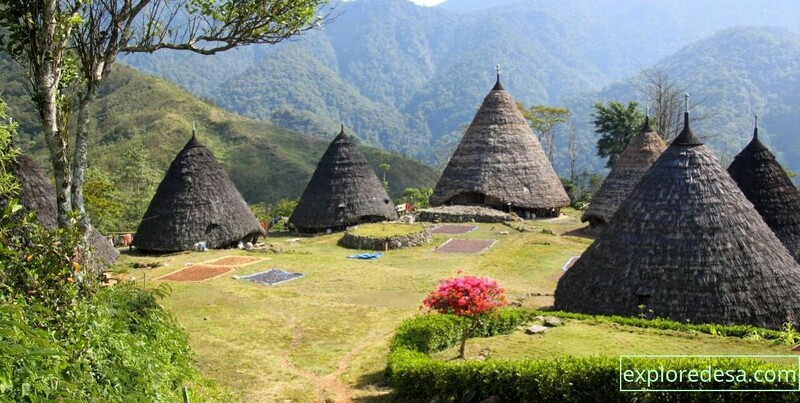 In the village of Waerebo, visitor can see conical houses, which one of it is a ‘drum house’ with very unique architectures, place for holding meetings, rituals and Sunday morning prayers. The drum house is a communal building for a clan or clan branch, symbolizing the ideal unity of patrilineal descent. Lunch will be provided in houses at waerebo village. The place has been developed as tourism site; sleeping on the traditional house and having local cuisine together with local community is very wonderful and unforgettable moment for the visitor. Afetr breakfast trekking down to Denge village, The view a long the trek to down land area is spectacular. Lunch will be served en route, The continue driving to Labuan bajo for overnight and dinner at Golo hill top Or Purisari hotel. and overnight at GOLO HILL TOP HOTEL or PURISARI HOTEL. to the airport for flight to Denpasar. • Personal medicine and first aid kit and other personal things. All itineraries and Prices are subject to change without prior notice.